The National Trust has nominated the DC-2 Uiver Memorial and its associated historic collection at Albury for listing on the State Heritage Register. The memorial was constructed by the Rotary Club of Albury West and dedicated by the Governor General Sir Zelman Cowan in 1980. The memorial and collection is of great social significance to the Dutch community in the Albury region and the Netherlands who co-operated over twenty years to manage the monument and whose representatives travelled through NSW to raise funding and promote the monument through Dutch cultural events which culminated in the monument’s later re-dedication by the Dutch Ambassador and Consul-General. The DC-2 which forms the centrepiece of the memorial is the oldest surviving DC-2 in the world. The memorial commemorates an event of international significance: the saving of the original “Uiver”, a Dutch KLM Airlines entrant in the MacRobertson London to Melbourne Great Air Race of 1934 and because it celebrates the role played by the people of Albury in saving the lives of those on board the Uiver which was flying the last leg of the epic London to Melbourne journey. 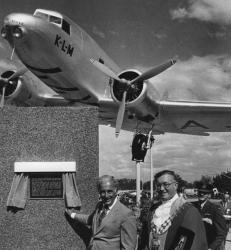 Their efforts enabled the all metal aircraft to be the second plane to finish and take first prize in the handicap section in an event that became the foreunner for the development of the passenger airliner DC-2s and later DC-3s and the development of the airline industry throughout regional NSW and Australia.